Take your studio with you to any location with this is the ultimate carrying solution for DSLR photographers. Use the Professional Comprehensive DSLR Carrying System Backpack to ensure that no location is out of your camera lens's reach. This backpack can carry all of those essentials needed when photographing - camera body, additional lenses, flashes, PMP, exposure meters, and more! The main compartment is a heavily padded compartment that will hold your body in an easy access compartment. With the padded Velcro adjustable partitions, make customized compartments for each lens and additional bodies. The exterior material is made of a durable canvas material that ensures long term resilience. There are numerous pockets and compartments for all of your essential acessories so you'll always be prepared to catch that perfect shot no matter where you go! The back and the adjustable shoulder straps are padded and breathable for longterm comfort. 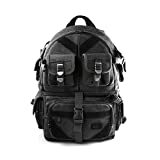 And with the adjustable front straps you can adjust the backpack to your custom fit for maximum comfort.